Parvati is the daughter of the Himalaya parvat (Mountain) or one who has undertaken austerities atop a mountain. Parvati : Names such as Parvati, etc. came into usage after the merging of the Shaiva (Worshippers of Shiva) and Shakta (Worshippers of Shakti) Tantras. 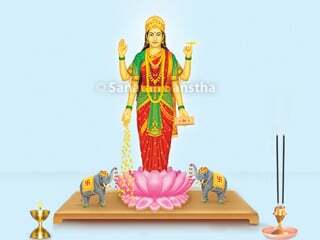 Before this, She was named variously as Aditi, Sundari, Surasundari, Pattambara (One adorning red clothing), Shvetambara (One in white attire), Nilambara (Dressed in blue) etc. Gouri : Gour means the radiance acquired through austerities. After Parvati performed intense austerities to receive a blessing from Shiva, She acquired radiance. It is because of this that She came to be known as Gouri. Karali : The word Karali has formed thus – ‘Kar + Ali’. ‘Kar’ means hands and ‘ali’ means rows. One who has rows of hands is Karali. ‘Kar’ also means one who works with the hands. Shakti that exhibits rows or lines of work or one that accomplishes multiple missions is Karali. The prevalent meaning of Karali is ‘terrible’. If an energy accomplishing multiple missions is to be pictorially depicted, then an artist will depict it in the human figure with multiple hands. Seeing a woman having four, eight or ten hands will frighten everybody. Therefore, Karali means ‘terrible’ became prevalent. Aparna : Aparna constituted by ‘a’ and ‘parna’ refers to one who performed austerities without eating even a parna (Leaf). Meaning : U (उ) means Shiva. The one who measures Him is Uma. Shubhada : ‘शुभं ददाति इति ।’ means one who bestows propitiousness is Shubhada. Non-duality : Non-duality with Shiva. She married Shiva first as Sati and later as Parvati. Desirous to learn Spirituality (Also known as jidnyasu) : In the Puraṇas, Parvati is portrayed as a woman extremely curious about Spirituality. To acquire the Shiva Principle concealed in various objects in the universe, She asks Shiva several questions and Shiva narrates to Her different kinds of vrats (Vowed religious observance) and stories associated with them. The vows and religious obligations performed by women have stemmed from the conversations between Shiva and Parvati. Compassionate : Parvati is an icon of compassion. She is instantly moved by the grief of the poor and the downtrodden. She hears the anxious call of the distressed even before Shiva does. She then awakens Shiva from His samadhi and requests Him to accompany Her in rushing to the rescue of the one distressed. Marak-shakti (Destroyer energy) : This form is fearsome and terrifying. During the slaying of the demons Chanda-Munda and Mahish, this form manifested suddenly. Shiva becomes functional solely due to this form of Shakti. Meaning : Shakti resides in the heart of Shiva and vice versa. Just as the moon and its light are inseparable, so are Shiva and Shakti. One should not consider them as separate. The Holy texts Kashyapashilpa and Manasar describe how an Idol of Parvati should be sculpted. They state – by Herself, Parvati should be portrayed with four arms and when beside Shiva, She should have two arms. When alone, a crown of matted hair should adorn Her head. The two upper arms should hold a lotus and a noose and the two lower arms should be in a posture bestowing a blessing (known as Varadamudra) and in a posture depicting protection (known as Abhayamudra). When accompanying Shiva, She should be seated on a lotus or standing embellished with ornaments. Her right hand should hold a lotus and the left should be straight by Her side. Meaning : According to the Vedas, the alphabet ‘da’ in Durga suggests destruction of demons. The ‘u’ has been accepted to represent over coming of obstacles. The half ‘ra’ signifies elimination of disease, ‘ga’ nullification of sins and ‘a’ the overcoming of fear and destruction of enemies. ‘Dur’ in Durga means evil and ‘ga’ means remover or destroyer. Hence, Durga means the one who destroys the evil. Formerly in different regions, various Devis were worshipped with several Names. The authors of the Puranas merged all these Devis into one, called Her Durga and accorded Her the status of the consort of Shiva. Meaning : Whenever there is harassment (of the world) by demons in this way, I will incarnate and destroy them ! 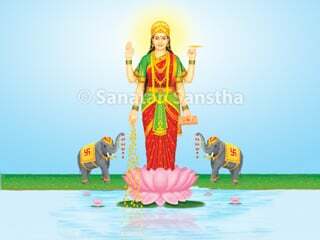 Meaning : All the Deities appeared before Devi and asked Her, “O Mahadevi (Supreme one), who are you ?” She replied, “I am Brahmanswarupini, a form of Brahman. This universe composed of the Prakruti (Primeval Nature) and the Purush (Absolute Being) and the unmanifest and manifest universe has been created from me. I am both, Anand (Bliss) and Niranand (Lacking in Bliss), ignorance and knowledge and also non-Brahman and the Brahman worthy of realisation”. 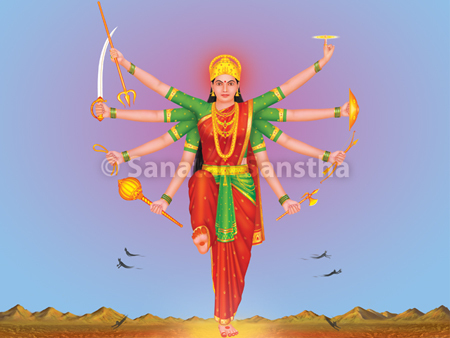 Shri Durgadevi is depicted in various forms having four, eight or ten hands, etc. Shri Durgadevi through the subtle dimension suggested the symbolic meaning of the various body parts in Her picture. What does it signify ? Meaning : Kali activates the time and is the basis of all Creation. With reference to Kal (Time), the five Cosmic Principles and living beings, Kali is the first to manifest Herself. Kali is called so because Kal itself is Her foundation, and She has existed since times immemorial. The text Tantralok defines Kali as is given ahead. Meaning : The Supreme Energy of Brahman which is the kriyashakti (Energy of action) is itself known as Kali. Kali dances upon the chest of Mahakal, that is, Shiva. In the Kalivilas Tantra, She is also called Shavasana or Shavarudha. In the Path of Tantra, both, a shav (Corpse) and Shiva are names of the same Principle. The first manifest form of the formless Brahman is shav. It is motionless. When vibrations of energy are generated in it, it is activated to create the universe and is referred to as Shiva. In other words, Brahman devoid of Shakti is a shav and Brahman along with Shakti is Shiva. The ‘i’ in Shiva represents Shakti. 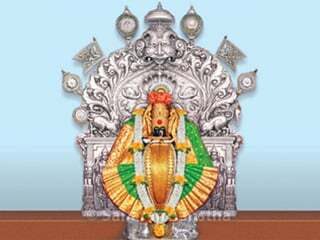 He being the support of the Divine play of the Mahashakti (Supreme Shakti), is known as Shavasan. ‘Hesauho (हेसौः)’ is the bij of a corpse and is known as a shavabij or a pretbij. At the time of Creation, this corpse assumes the form of a padma (Lotus) and becomes the asan (Seat) or site of Divine play of Mahamaya Kali. This is known as Kali’s mahapret-padmasan (The great lotus seat of the corpse). The same meaning has been conveyed in the shloka ahead. Meaning : Devi Kali, seated on the red lotus, is the form of Mahamaya (Great Illusion). She bestows the corpse, that is, the inactive Brahman with chetana. 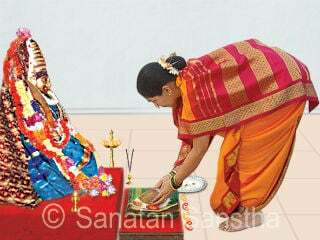 What is importance of 'offering a sari' for the Goddess? A string of beads used to keep a count of the chanting. A hymn of praise. These hymns praise aspects of the Divine, such as Devi, Deity Shiva, or Shrīvishṇu. 1. That aspect of Divine consciousness that governs the functioning of the mind and body, 2. Sentience.